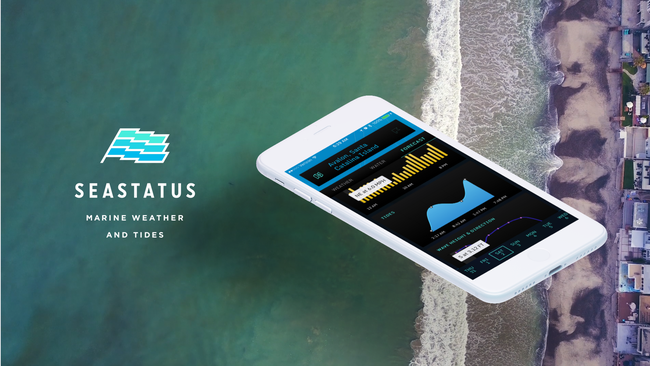 SeaStatus gives simple, personalized, and accurate marine weather reports to anyone with an internet-connected mobile device. Checking the weather is a daily habit for consumers, yet it can be challenging to find and interpret the most accurate marine weather. Good data exists and is getting exponentially better, but the experience of consuming it is painfully outdated. We want to make that habit an enjoyable experience for anyone who wants to go out on the water. With SeaStatus, we’re turning some of the most advanced and complex data sets in the world into a super simple, easy-to-understand interface in an app that’s a pleasure to use. By aggregating, organizing, and thoughtfully displaying the most actionable information, SeaStatus empowers everyone to apply the weather readings to their unique needs. Apps of this nature are similar to gyms. The best one is the one you actually use. Everyone is overloaded with apps on their phone, so we aim to be an experience that sticks with you. Only by providing this type of simple, straightforward experience can we efficiently deliver this crucial ocean information to the people who need it. Although our inception was humble, we are determined to put the power of ocean knowledge in everyone’s hands so that they can go out and do the things they love. - The avid sailor catching the best breeze. - The weekend warrior determining the best date for her kayak trip. - The beachgoer knowing the optimal time to head to the tide pools. - The angler noticing that he is near an environmentally protected no-take zone. - The volunteer tracking the conditions before a weekend beach cleanup. - The whale-watching boat informing its passengers about the local waters. - The local tackle shop notifying visitors of a small-craft advisory. - The high school teacher checking the chances of rain before planning a beach field trip. - The vacationer exploring the local islands’ unique weather conditions. Using the best web-based mapping solution available, we’ve built a user-friendly way to explore and select locations across the continent in an instant. - Locations are intelligently grouped and displayed so the user can browse effortlessly. - While SeaStatus currently supports locations primarily in the U.S. (to ensure initial accuracy), the app is built to scale globally with minimal development overhead. - The map page also has the ability to add layers. In this initial build we’ve added environmentally protected areas and bathymetric data. Our hope is that this data informs users about the often unseen and important details of their local surroundings. - Thanks to the ability to add additional map layers simply, we are in a unique and exciting position to partner with other participants in the competition to add data overlays onto our map and with our existing user base. - All weather data is pulled in via APIs from the Data Sources below. - The interface is designed to optimize quick and easy comprehension of conditions. - The Weather and Water pages display observational data (aka the real-time conditions). - It’s designed to deliver accessible but robust data visualizations on the forecast page for at-a-glance overviews. WAVEWATCH III® (Tolman 1997, 1999a, 2009) is a third generation wave model developed at NOAA/NCEP in the spirit of the WAM model (WAMDIG 1988, Komen et al. 1994). It is a further development of the model WAVEWATCH, as developed at Delft University of Technology (Tolman 1989, 1991a) and WAVEWATCH II, developed at NASA, Goddard Space Flight Center (e.g., Tolman 1992). WAVEWATCH III®, however, differs from its predecessors in many important points such as the governing equations, the model structure, the numerical methods and the physical parameterizations. The HYCOM consortium is a multi-institutional effort sponsored by the National Ocean Partnership Program (NOPP), as part of the U. S. Global Ocean Data Assimilation Experiment (GODAE), to develop and evaluate a data-assimilative hybrid isopycnal-sigma-pressure (generalized) coordinate ocean model (called HYbrid Coordinate Ocean Model or HYCOM). This tool powers the most popular weather applications in the world. Best of luck to you Jonsen!! Hey Jonsen, this is a great app! Simple, cool interface, and all the right info. I use it for surfing and sailing. We'll be making a Gulf crossing next week and will have it with us. Thanks - great work! Good effort ! Awaiting international locations inclusion ! Ние сме фамилия, която редовно ходим по реки, езера и морета. Въдиците са неизменен атрибут на моя син и моя брат. Does this work on the Great Lakes? Great idea! This app would be a really helpful tool for my husband who goes fishing all the time. Hi Anelia— We're really excited to launch this version to the public ASAP! Great idea, guys. The power is in the well maintained simplicity. Good luck! We totally agree Dimitar. Thanks for checking out the tool!